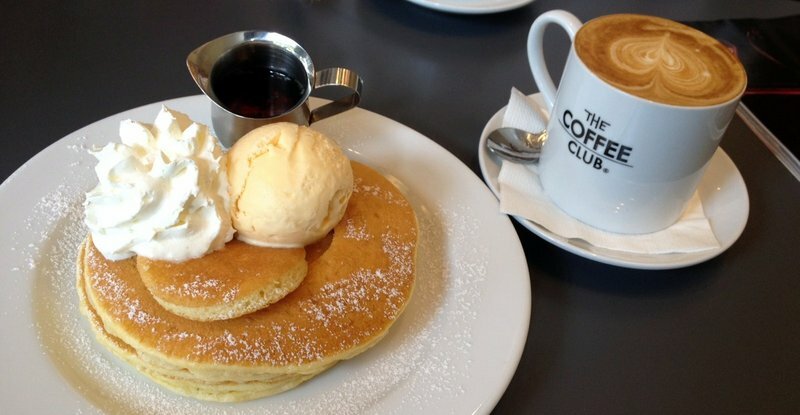 The stack of pancakes was topped with a scoop of vanilla ice cream and some whipped cream. Add to that the syrup and it was a plate full of adult-onset diabetes as the way to start my day. Yikes! I must say, though, that I like the little circle they cut in the top pancake of the stake, to better hold the scoop of ice cream. Thoughtful. This entry was posted in Uncategorized and tagged breakfast, coffeeclub, food, icecream, pancake by christao408. Bookmark the permalink. @n_e_i_l – Exactly, and the ice cream wasn’t even good. @Grannys_Place – What’s a few more pounds, right? I do like ice cream not with my pancakes and no whipped cream thank you. It is a good presentation but too much for me. that looks so good! i’m gonna try that at home. but we have triple fudge and cookies n’ cream ice cream. Interesting combination. But then some people put whipped cream on top of pancakes so why not ice cream. I’ll take that plate if you don’t want it. Mmm…that looks really good. I would ask for a scoop of chocolate! I didn’t know what I was craving for days until I saw this picture. I knew it had something to do with ice cream. hmm… i wonder if someone mixed up the idea of pancakes and crepes? hate to say it, but i’m really not a pancake fan. Might get away with once a week. @snowjunky8 – You wouldn’t have enjoyed your holiday so much if you hadn’t had all those great taste experiences! =D@isitreal_no – @stepaside_loser – I think it is really funny that both of you thought that Coffee Club was American rather than Australian. It strikes me as what non-Americans might think an American breakfast place is like and isn’t nearly as good as some fantastic breakfast places I ate at in Melbourne. @Inciteful – If only I could restrain myself…@kunhuo42 – Honestly, most pancakes I eat are pretty disappointing. There is one place in SF that has good cakes but I think that’s because they’ve been using the same griddle for about 70 years and, like a good wok, it has that flavor that can only come from well-seasoned iron. @nov_way – Fresh fruit! Ideally, perfectly ripe peaches although juicy strawberries would be fine, too. @specialxplaces – Problem solved! Time to go get some pancakes and ice cream. @Emily_Rose_Dreams – I didn’t think to ask if they had chocolate… because I didn’t even realize they were going to serve them with ice cream! @chronic_masticator – If only you had been there to save me! @awoolham – Whipped cream is a lot less heavy and sweet than ice cream. @f5ye_angel5 – Oh, my…@CurryPuffy – Too much, I think. @maniacsicko – I’ll know what to order for you next time…@Fatcat723 – Too much for anyone, I should think! @SherryAngeLMysteriez – I’d have to add fasting to the dieting after a breakfast like that. Maybe as a birthday treat rather than typical cake/icecream later in the day. One could also ask for an extra fork and share that with a friend; twice the fun. Usually I’ll hv this as a snack or dessert …. This is such a grand idea. I think I will steal it from your blog. I just like my pancakes with maple syrup and a bit of butter / margarine. When I first saw the picture, I thought that was a scoop of butter! @Wangium – True enough. @ElusiveWords – That was my first thought, too. Imagine my surprise when the “butter” was sweet, frozen, and vanilla flavored. @rudyhou – Oh, you can have all three, dear. @ZSA_MD – You cannot steal what I freely give! @agmhkg – two or three or a half-dozen people, more like! the real breakfast of champs!